The Rev. William Daniel O'Connor was born in Columbs, Indiana. He was washed in the Name of the Triune God in the waters of Holy Baptism and was confirmed at St. Peter's Lutheran Church in Columbus. Pastor O'Connor graduated from Concorida College in Ann Arbor, Michigan, where he earned a degree in Psychology/Sociology. He then enrolled at Concorida Theological Seminary in Ft. Wayne, Indiana. He graduated with a master of Divinity degree in 1994. 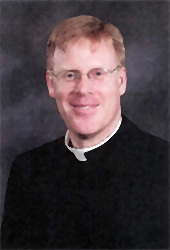 Pastor O'Connor served as Vicar at St. Paul Lutheran Church in Greenwich, Connecticut. After his ordination, Pastor O'Connor was installed as pastor of Grace Lutheran Church in Key West, Florida. He served until 1997 when he then accepted the call to be pastor of Trinity Lutheran Church in Valonia, Indiana and Faith Lutheran church in Salem, Indiana. He served those two congregations until accepting the call to be pastor of St. Luke Lutheran Church in Winamac, Indiana in 2001. In 2007 he accepted the call to serve Faith Lutheran.